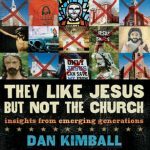 I recently picked up and reread my copy of They like Jesus, but not the Church by Dan Kimball, in reaction to a post I read this week at the Christian Manifesto. Kimball gears his book at those who want to get out of the Christian subculture and actually engage people in spiritual conversation. Most of Part I is how he came to that discovery in his own life as a pastor and church planter. I found myself nodding in agreement way too many times, guilty as charged. we are too busy inside the church to know those outside the church. I’m sure there are other books, but these three immediately come to mind in terms of reengaging the culture. Part 1 of Dan Kimball’s book describes how the culture is changing, particularly in North America. These are not statistical observations, but observation based on his real life conversations and interactions with the culture. What he states may seem obvious now, as many others have followed in Kimball’s footsteps. I need not spend a lot of time here. He’s quite brutally honest about how the church has failed to stay connected with the culture. The message may not have failed, but we are failing in our method. 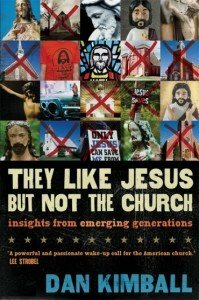 Part 2 asks the question: What Emerging Generations Think about the Church. This 6 chapter section reflects hundreds of personal conversations that Kimball has had, and many of the same things that Barna’s statistical research revealed in unChristian. Anyone who is seeking to engage the current culture shapers should be aware of these items. This part provides an excellent window into North American Culture. Part 3 is on how the church can respond. His book has excellent ideas about conversation, dialogue, and theological discussions about conversational evangelism. I like what he has done with the Bridge Illustration, by adding a 2nd chasm to cross – that second chasm is the Christian subculture that has so alienated seekers, that one needs to build bridges of connection there as part of the gospel explanation process. Bridging that gap by being in the world but not of it, spending time in conversation with non-Christians are all part of that trust building process. What can you do this week to have a spiritual conversation with someone outside of your church? 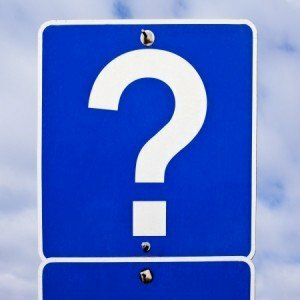 During January, I received a series of questions via Ask Evangelism Coach section. I’ll take a few posts to answer them. If you have a question to ask, please do so there, or on Twitter or Facebook. Do you have a comment on the issue of becoming silent when one has an opening to share his/her faith? Yesterday I went skiing and the girl with whom I took the lift used the word “Jesus” when she saw a friend down below. Why does this happen? I have prayed for boldness a lot – why do I clam up? Well, I just stayed there and didn’t say anything and thought later how sad I was that I didn’t talk about Jesus with her. While I can’t answer the particular question about why you go silent, I can offer a summary of common evangelism fears that paralyze us. Fear of what others will think about you. To mess up somebody’s eternity destiny is your fault. This is a good practice to do, and one that I do after nearly every possible conversation. Continued rumination after every event can help you grow in your skill. It can also help you grow in your confidence. Learn from every possible conversation. What would you say if a similar situation encountered. Instead of analyzing the fear, think forward: what would you do differently next time? While not evangelism, here is a life example where reflection, rumination and training paid off. We live in a high rise apartment building. My youngest cannot reach the buttons for our floor. What would happen if we were getting in the elevator, but the door closed with my youngest in the elevator without an adult and it started moving to another floor? We talked with my youngest about what to do. Every few weeks we ask: what would you do if that happened? Would you need to be afraid? She is now able to give an answer without thinking about it. No fear. Go to the lobby and wait. Believe it or not, about two weeks ago, it happened that the elevator doors closed and it moved to another floor before I could get on. My youngest calmly followed the directions of her training. There was no fear, no paralysis, no panicked child in the elevator alone. Reflect on the last possible evangelism conversation that you had where fear paralyzed you. Instead of wondering why, push forward — what would you do differently the next time a similar situation occurred. What question would you ask to possibly see if there is an open door to talk further?